How to score free pictures and prizes with the Easter Bunny starting this weekend! Everywhere you can get free pictures with the Easter Bunny! Easter is springing up on us! If you want those precious photos of your kids or furry family members with the Easter Bunny, here's how to do it all for FREE! The Easter Bunny will be at the Westgate Entertainment District starting Friday, April 5 through Saturday, April 20, right by Fountain Park, in front of AMC Theatres. Get one free, downloadable digital picture. Other packages and multiple poses are available for purchase. Photos are on a first come, first served basis. Click here for more details. Monday, April 15 is furry friend (dogs only) photo day! Not far from there, the Easter Bunny hops over to Park West starting Saturday, April 6 through Saturday, April 20. Visits are FREE, but you have to buy picture packages, which start at $27. So get your camera phones ready to snap a few candid moments and save cash! This Sunday, April 7 from 10 a.m. to 11:30 a.m., there is a Sensory-Friendly Bunny Event, and it is Autism Awareness Month. 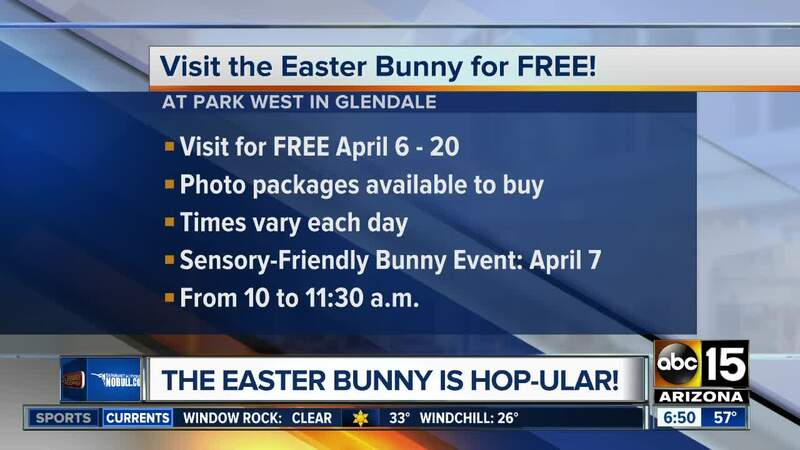 This is the information we were sent: Through a partnership with Cherry Hill Programs and Autism Speaks, families with kids and adults with special needs of all kinds can enjoy an experience with the Easter Bunny. Schedule a time in a sensory-safe, quiet and inviting environment. Visits are always free and photo packages are available for purchase. Space is limited and families are encouraged to reserve a time in advance by visiting shopparkwest.com under the events section. Sunday – 12 p.m. to 6 p.m.
Then, the Easter Bunny is at Desert Ridge Marketplace starting April 6 through April 20 on the AMC Lawn in The District. Score a FREE downloadable photo and complimentary bunny ears! On April 6 only from 11 a.m. to 1 p.m., there is an Easter Fest with activities, games, face painting, and there will be over 1,000 balloons that will drop with more chances to win giveaways to stores inside! There will also be an egg hunt. The start times are broken down into age ranges. Guests are encouraged to arrive at least 15 minutes before the selected start time. Click here for more information. Monday - Saturday: 11:00 a.m. – 7:00 p.m.
Do you know of any other places to see the Easter Bunny for FREE? Email me and I'll add them to this list. I hope these experiences make you HOPPY!